I was talking with a friend of mine the other day about the reaction of some individuals during periods of high stress. He described a sort of paralysis that can over take some when they are not sure what to do next. I mentioned that one of the key mistakes that many will make is not doing the things that they would normally do, that they should do. 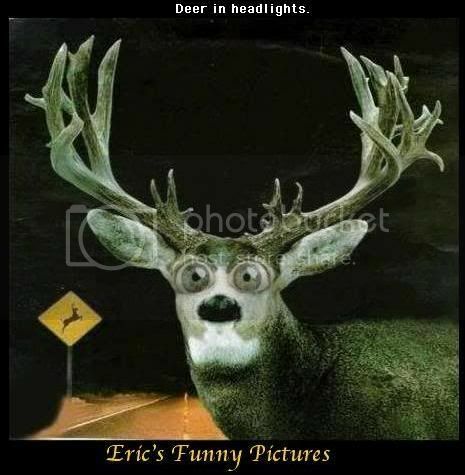 This deer caught in the headlights reaction is by no means a survival instinct. In fact, it’s quite the opposite of it. It’s the very thing that causes people and companies not to survive. When you’re a startup company, and on the verge of tough times, you have to react quickly. The discussion eventually found its way to the subject of leadership and the need for leaders to step up during such crises. And I certainly agreed with that sentiment. But leaders have to develop a sort of reflex to avoid the paralysis too. Otherwise they’ll likely lead their departments in the wrong way. Anyway, I can certainly say a lot more on this subject. Just because I’ve done a few startups, doesn’t mean it necessarily gets easier. It just means my instincts have evolved. Encouraging Bits, Mike Stuff, Techy Stuff dear in headlights, fear, reflexes, startups. permalink. The fact you have done a few startups, definetely gives you the experiencie and the know how, as to how to make it during tough times, such as now. However, you are right, it takes leadership of the right kind, to be able to stir the ship in the right direction, moreover, your instincts may have evolved, but more importantly, I think you know have more wisdom and persistance to reach the targeted goal. This is sort of the story of my life 🙂 You are right, it is NOT a survival instinct. It is a symptom of depression and a sure road to ruin.